Vision Zero is a road safety program that was first started in Sweden and then successfully applied in many other European countries. When Bill de Blasio became the mayor of New York, he also implemented a Vision Zero strategy for New York City which over the last four years led to a significant reduction of traffic deaths, especially pedestrian fatalities. While traffic deaths have been decreasing in New York City, they have been increasing at the national level. In the steps of Sweden and New York, the National Safety Council recently created the “Road to Zero Coalition“(RTZ) and just released “The Road to Zero, A Vision for Achieving Zero Roadway Deaths by 2050” a comprehensive report on how to apply Vision Zero Strategies at the national level and end roadway deaths in the US by 2050. 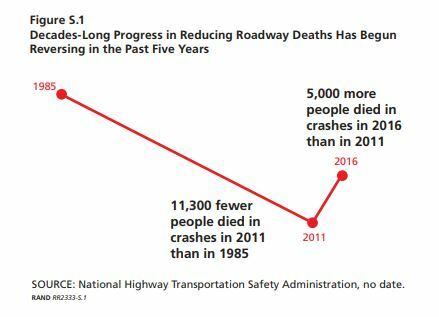 Roadway fatalities which had been declining in the US between 1985 and 2011 started to increase again between 2011 and 2016. In 2016, 5,000 more people died in roadway accidents than in 2011. Young people aged 15 to 24, men and rural road users are the most at risk of dying in a car crash. There were 93 traffic fatalities in New York City for the first 6 months of 2017. This is the first time since traffic accident data began being recorded in the City that this number went below 100. 203 people died in motor vehicle accidents in NYC for the full fiscal year that ended on June 30. These numbers were announced a few days ago by Mayor Bill de Blasio. 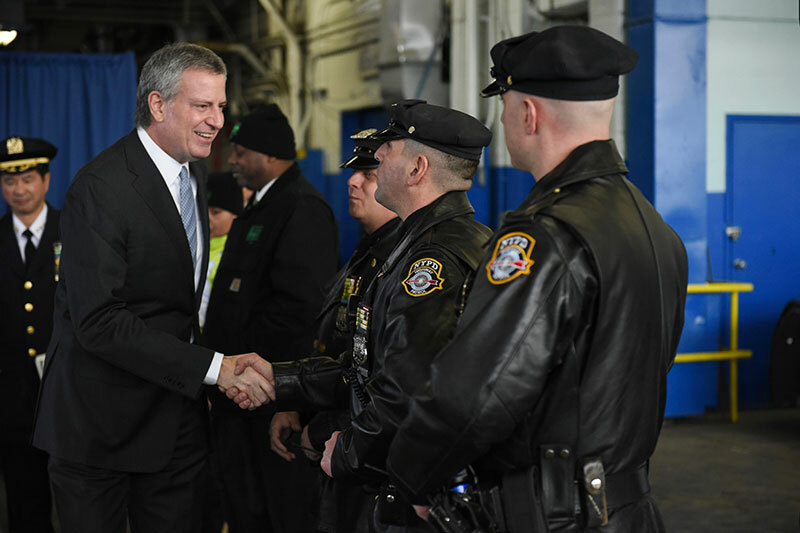 “No loss of life on our streets is acceptable, but under Vision Zero, we have seen continued and consistent progress, with traffic fatalities on the decline for three-and-a-half-years, strongly countering national trends,” said Mayor de Blasio. 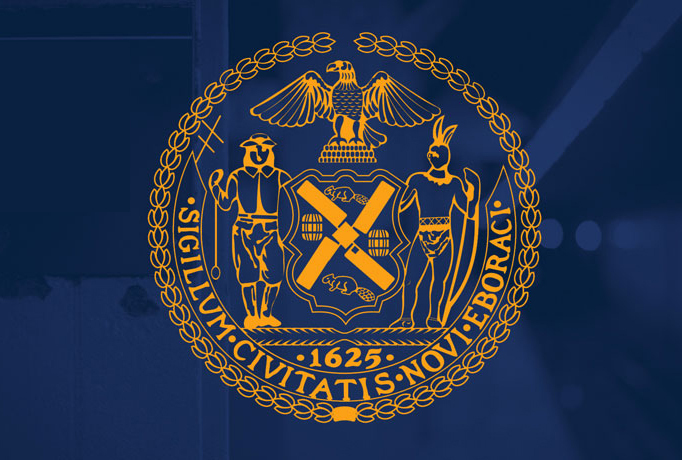 Since 2014, the city has been taking multiple measures such as street redesign and traffic enforcement to try to make the streets safer for all New Yorkers. Pedestrians, especially children and seniors are the most at risk of being fatally struck by a car. Among the 93 people who died in traffic accidents, 47 of them were pedestrians. Respectively 63, 54 and 55 and of them died during the same period of 2016, 2015 and 2014. Is de Balsio serious about stopping traffic deaths in New York City? Among the many Vision Zero initiatives to reduce deaths and injuries related to traffic accidents in New York, the city has installed pedestrians islands at dangerous locations. Last December, such islands were installed along Eastern Parkway in Brooklyn. The main objective of these pedestrians islands was to protect numerous children who were crossing the dangerous parkway every day to go to school. Eastern Parkway was identified as a priority corridor in the Vision Zero Brooklyn Pedestrian Safety Action Plan. Between 2009 and 2013 4 people died and 7 were severely injured in the Eastern Parkway segment between Grand Army Plaza and Ralph Avenue. Last week a few days before the West Indian Day Parade, the New York City Department of Transportation destroyed the concrete medians at Kingston and Brooklyn Avenues. The destruction happened after the organizers of the West Indian Day Parade asked the DOT to do do this so the floats could navigate the road. When asked about it De Blasio said the islands were posing a parade safety hazard. The destruction of public infrastructures that have taken residents and road safety advocates years to be installed is leaving people scratching their heads and wondering how serious de Blasio is about making the streets of New York City safer. E. 165th Street between Jerome Ave and Melrose Ave was flagged by Vision Zero for a safer street redesign. Between 2009 and 2013, two pedestrians died, 37 were injured (including 5 severely) and 6 bicyclists were injured in traffic accidents at this specific part of the street. The two fatalities occurred at the intersection of E. 165th St. and The Grand Concourse where the 11 year old boy was critically injured last week. According to Vision Zero statistics, 50% of the pedestrian accidents on E 165th street are caused by drivers failing to yield and 28% of all motor vehicle crashes on this street took place while a driver was making a left turn. Last year a total of 133 pedestrians died in car accidents in New York City compared to 139 in 2014. This is is the lowest number of pedestrians killed in traffics accidents in New York City in a year. 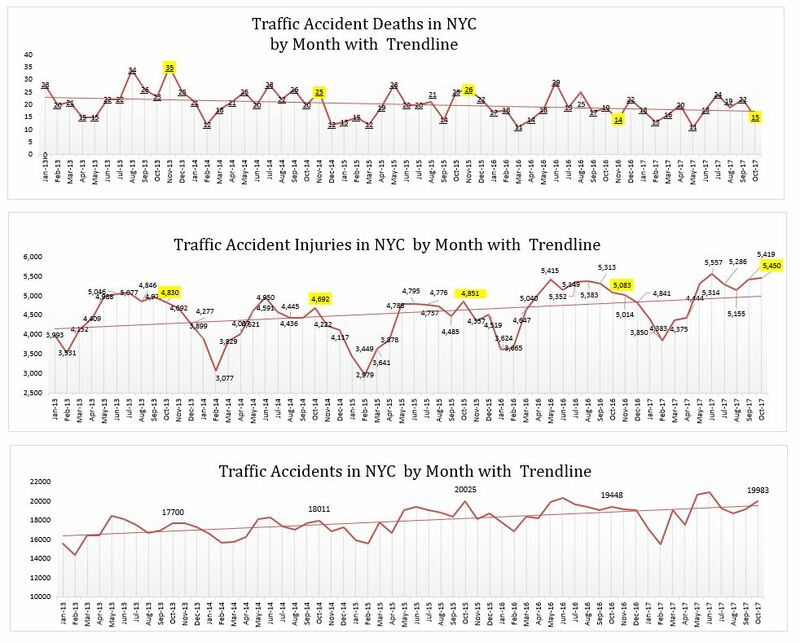 This decreasing trends in pedestrian fatalities in the city can be credited to the Vision Zero initiative launched in 2014 by the mayor de Blasio administration. The installations of speed cameras and the lowering of the city default speed limit are some of the measures that have helped in reducing the number of pedestrian deaths. 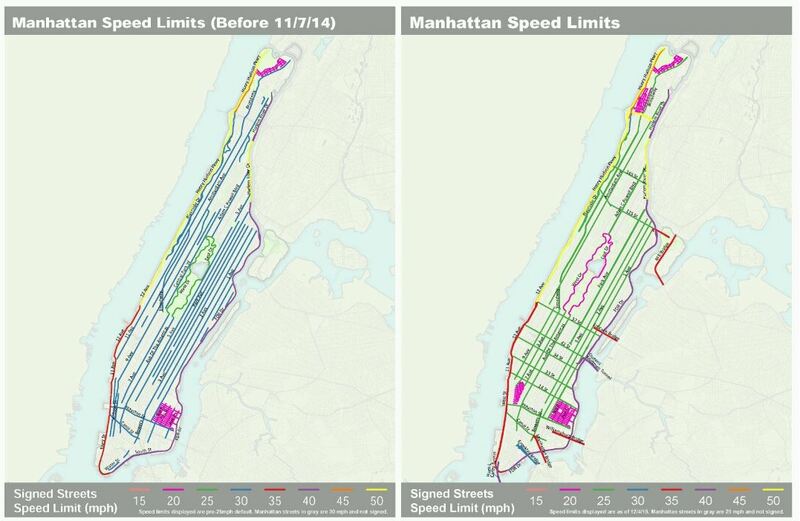 Safer street redesign by the DOT such as the creation of slow zones in residential neighborhoods, the redesign of many dangerous intersections in the city as well as the creation of arterial slow zones also contributed to make streets safer for New-Yorkers. 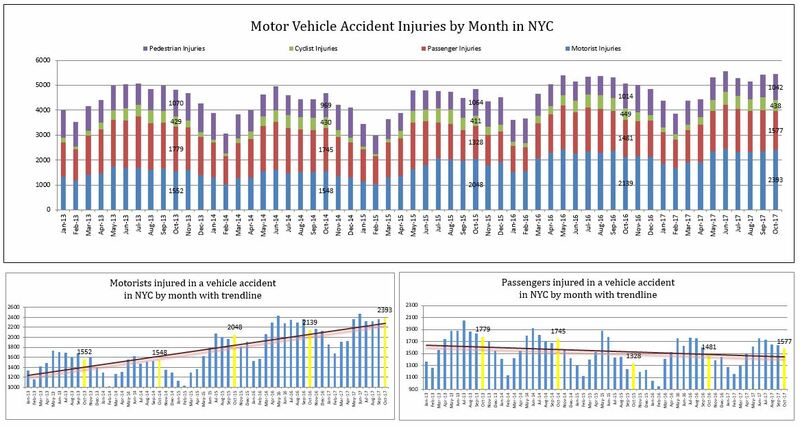 776 pedestrians, 513 bicyclists, 1236 passengers and 1960 motorists suffered personal injury in motor vehicle accidents in New York City in September compared to respectively 714 pedestrians, 565 bicyclists, 1448 passengers and 2010 motorists in August and 751 pedestrians, 485 bicyclists, 1677 passengers and 1523 motorists in September 2014. While the number of pedestrians injured in NYC traffic accidents has been below 1000 since the beginning of 2014, the number of people injured in bicycle accidents stayed over 500 for the last 3 months. The number of motorists injured has also been unusually high and staying above 2000 for the last 3 months. 4 pedestrians, 2 bicyclists, 2 passengers and 6 motorists died in motor vehicle accidents in September compared to 11 pedestrians, 3 bicyclists, 2 passengers and 5 motorists in August and 13 pedestrians, 1 bicyclist, 4 passengers and 8 motorists in September 2014. The Vision Zero Initiative is having a positive impact. Since the beginning of the year, it is the fourth month that the total monthly traffic fatalities are below 15. In 2014 it happened only twice and in 2013 the monthly number of people dying on New York City Streets never went below 15.